The primary mission of Sources of Strength is to build resilience, increase the connections and trust towards adults, increase help-seeking, developing and enhancing protective factors (8 strengths), and breaking down codes of silence. Through this program we hope to reduce the number of people who struggle and increase their ability to seek help before the crisis moment. Below are several Sources of Strength activities that can benefit our community. Host a “Family Fun Night” or Family Picnic. Lead games that encourage youth/parent interaction and partnership. Let your family know how important they are to you. Take pictures with your positive friends. Print out the pictures and write things you appreciate about them. Post a picture and description of a positive friend. Write names on stickies and create a wall of trust. And then make thank you cards for Trusted Adults/Mentors. Interview a Mentor/Mentee, highlighting both sides of the relationship and share in written or video form. Invite someone to try one of your favorite healthy activities with you. Post a photo of you doing your favorite healthy activity with a description. Make Thankfulness posters or a video, or keep a Thankfulness journal. Let people know that your are thankful for having them in your life, either in person or with a thank you note. Have a spinning wheel that features the 8 Sources of Strength. 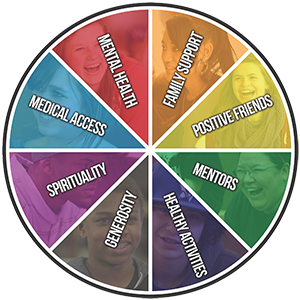 Spin the wheel and share a story about generosity in your life related to the strength that the wheel lands on. Conduct Random Acts of Kindness. Share the experience with others. Find positive statistics about how helpful local medical services have been in your community and post them online. Host a health-fair with free check ups, screenings, information sessions, etc. Join interactive discussions focusing on what helps in dealing with anger, anxiety, and/or depression. Share resources available to students and the community.